The aim of the conference is to provide a forum for the exchange of ideas and the presentation of new tools and solutions. Another goal is to foster personal contacts among researchers from different fields related to AI and Symbolic Computation. The conference is concerned with all aspects of research, including theory, implementations and applications. Conferences in this series are usually held every two years. The previous five ones took place in Sevilla (Spain), Paris (France), Birmingham (United Kingdom), Beijing (China) and Linz (Austria). 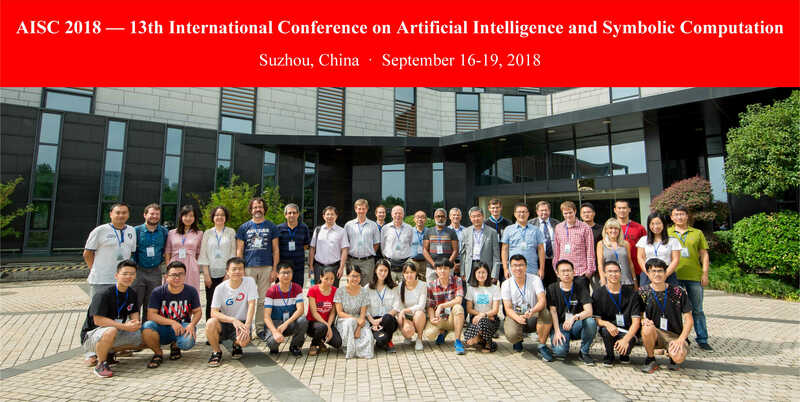 AISC 2018 will take place in Suzhou, China. Artificial Intelligence and Symbolic Computation are two views and approaches for automating problem solving, in particular mathematical problem solving. The two fields intersect with each other on a large number of underlying problems with respect to symbols. Hence, a wealth of challenges, ideas, theoretical insights and results, methods and algorithms arise in the interaction of the two fields and research communities. Advanced tools of software technology and system design are needed and a broad spectrum of applications is possible by the combined problem solving power of the two fields. Original research papers in English, including experimental work and work in progress, are welcome. The following two types of submissions are invited. REGULAR paper: maximum 15 pages. Problem: what is the problem/question/objective? Motivation: why do we work on the problem and what is the importance? State of the art: what has been done already on the problem? Contribution: what is the main original contribution? Main idea: what is the main idea underlying the contribution? All papers must be categorized as SHORT or REGULAR and indicate whether they are being submitted to the Main Track (MT) or Special Track (ST). Paper titles must be tagged as illustrated here: “SHORT-MT: …title…” or “REGULAR-ST: …title…” The 2-part tag is in the same line as the title. The Track tag is mainly a hint to the PC and non-binding on the author or on the PC. Submissions should follow the standard Springer LNCS Proceedings format. Electronic submission as PDF is required via EasyChair at http://www.easychair.org/conferences/?conf=aisc2018. All submissions will be formally reviewed by PC members and external referees. Decision on the SHORT paper will be made on a rolling basis, normally about 10-15 days after submission. At least one author of each accepted submission must register at AISC 2018. All accepted SHORT or REGULAR papers will appear in a conference proceedings volume published by Springer in LNCS. In addition, REGULAR papers have the opportunity to be considered for post-conference special issues of some journal.